Love was certainly in the cold air this Polar Plunge season – but particularly so at the Manteno Polar Plunge. 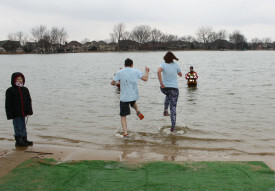 For the first time in 17 years of Plunges in Illinois, a couple agreed to take the metaphorical plunge before they ran into the icy waters of the Manteno Sportsmen’s Club. As Steffani Vizdal lined up with her team – Team Baymax – her boyfriend, Brad Hommes, knelt in the sand and popped the question. Steffani first got involved in Special Olympics through South Suburban Special Recreation Association, where she has worked for the past nine years. When she’s not working at Special Olympics, Steffani works at a hospital in Chicago in the emergency services department. Brad works for a specialty golf club company in Tinley Park. The couple share so many passions, but they take the most pride in is working with the Special Olympics. 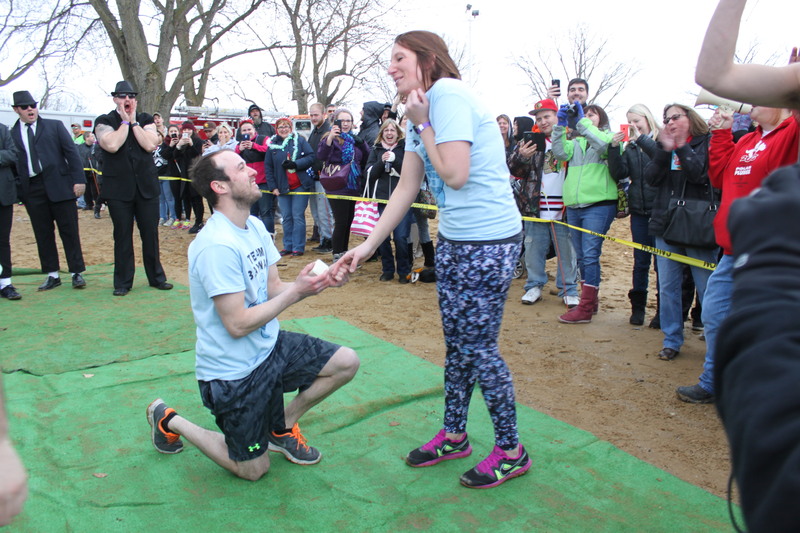 She met her now fiancé three years ago and they did their first Plunge together last year in Manteno. “We choose the Manteno Plunge location because we are able to see the money donated go directly to the participants and athletes that I coach and work with,” Steffani said. Throughout the year, she coaches Special Olympics basketball, soccer and athletics (track & field). Brad recently completed his coaches certification last June for basketball and golf and the couple are hopeful he will begin coaching golf through South Suburban this spring. “For both Brad and I, Special Olympics is not just a ‘job’ that we do, but a slot of time every week where we enjoy getting together with amazing individuals, to enjoy recreation and learning new things about ourselves,” said Steffani. Brad decided to propose at the Plunge for several reasons. The event not only meant a lot to Steffani, but he appreciates and recognizes her greater appreciation for the Special Olympics Illinois athletes. “Working with the athletes is something that keeps me going every day,” Stefanni explained. The Manteno Polar Plunge saw 503 plungers and raised more than $171,000.